In April, Carlson Design attended the 2010 Southwest Industrial Fabrics Association (SWIFA) Trade show – we had a blast! Draw as easily (or easier) on the computer than by hand. Make cutting entry level – have your best people work on where needed, not on cutting. Reduce labor – Chism went from 7 people in the cut shop to 3, and grew their production. Push the bottle necks down the line. For Market Day on Saturday we brought everything needed to demonstrate a complete Awning/Canvas “system”. 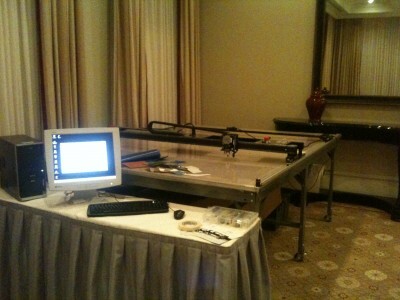 This included our PT-72 plotter/cutter, our steel frame vacuum table, a computer, and T-bar digitizer. Using the T-bar, anyone can digitize old and new awning patterns and then quickly have the plotter/cutter plot seam lines and cut perfect patterns. Jobs are now stored digitally – making for an easy recover in 3-5 years. The Captial Hotel in Little Rock was wonderful a wonderful spot – Thanks to everyone at SWIFA for picking a great location and putting on a great show. We can’t wait for Phoenix 2011. If you are a fabricator in the Midwest, we highly recommend you check out this organization.